I love talking with book groups. Unfortunately, I get requests from book groups much too far away geographically. But thanks to the wonders of technology, I can visit with your book group virtually—on Skype. Skype is easy to install, easy to use, and we can chat as if we’re in the same room. And it's free. To arrange to Skype with me during your book group discussion of one of my novels, simply send me a request using the Contact link. We’ll work together to set up the date and time. Former Dominican novice Joanna Stafford occupies a precarious position—one that is all the more dangerous because, unbeknownst to Henry VIII, she has twice been implicated in plots to overthrow him. So when she is called to Whitehall Palace to oversee Henry’s valuable collection of tapestries, she is understandably wary. But even in her new position of favor, Joanna has much to worry about, and her worst suspicions are realized when an assassin makes an attempt on her life minutes after she sets foot in Whitehall. Meanwhile, her naive and beautiful friend Catherine Howard is being courted by the king, despite his still being married to Anne of Cleves. 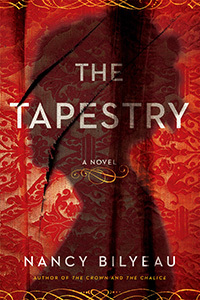 When Joanna discovers that some of her closest allies have hatched a sinister plot with occult underpinnings, she is thrust into another high-stakes game of life and death that will take her from the highest offices in the Holy Roman Empire to the executioner’s scaffold on Tower Hill in an attempt to discover, once and for all, the life she is meant to lead. 1) Upon her arrival at Whitehall, Thomas Culpepper tells Joanna that Henry VIII “desired a court built on chivalry.” Would you describe Hans Holbein as chivalrous? What about Culpepper? Cromwell? The king himself? 2) Though she is certainly a “woman of surprises,” as King Henry calls her, Joanna finds ways to use men’s assumptions about a woman’s role to her advantage. How does being a woman give Joanna advantages in court? Compare what Joanna does to the ways Catherine Howard uses her femininity as a tool for advancement. 3) Catherine Howard poses for a tapestry of The Sorrow of Niobe. In Greek myth, Niobe claimed that, because she had fourteen children, rather than just two, she should be worshipped instead of Leto, the mother of Apollo and Artemis. Apollo and Artemis punished Niobe’s hubris by killing her children. Why do you think Henry chose this subject? Can you draw parallels to any themes in the novel? 4) Holbein says that Joanna is “someone who sees the world in black and white,” and she can be quite single-minded in her ideas about the court. How does Joanna’s view change over the course of the novel? Give examples of some issues that become more complex for her. 5) Holbein tells Joanna, “There is no one law in the German lands. Each kingdom, each dukedom, each principality has its own laws. It’s easy to make mistakes, but those mistakes can be hard to recover from.” How is this similar to Joanna’s life at court? How does she have to juggle shifting sets of values and codes in order to survive in England? 6) What do you think of Joanna’s decision to involve herself in the dark magic necessary to undo the spell she believes has been cast on Culpepper? What does it tell you about her character? Were you surprised by her belief in Orobas’s power? 7) Joanna struggles with whether to tell Geoffrey about the prophecy that shapes her life. Do you think that she does this more for her own protection or for his? Why? 8) Transformation is a major theme of this novel, and Joanna is witness to many personalities who are changed by love (or lack thereof). Compare Catherine Howard, Thomas Culpepper, and Geoffrey’s transformations in the novel. How does love change these characters’ fates for better or for worse? Is love worth it for these characters? 9) Joanna is often torn between her duties as a subject of the king and her duties as a woman of God, one whose Catholic beliefs are directly opposed to the court’s mandates. At times, she must compromise in order to survive. Describe Joanna’s personal moral code. Do you respect her as an ethical character? Why or why not? 10) Joanna has a complicated relationship with Catherine Howard; and Joanna can’t quite bring herself to approve of Catherine’s choices. Yet at the end of the novel, Joanna is willing to lie in order to bring Catherine happiness. Did you expect this? Would you have done the same? 11) Near the end of The Tapestry, Edmund says that Bishop Gardiner “would do anything if it meant bringing him—and this kingdom—closer to God.” Contrast this with Joanna’s personality and goals. How are Joanna and Gardiner alike and different in in the ways they stick to their moral codes? Who do you most admire? 12) What do you think will come next for Geoffrey Scovill and Joanna Stafford? In 1538, as England is torn apart by violent power struggles between crown and cross, Joanna Stafford, a young novice whose monastic life has been dismantled, finds herself unwittingly drawn into a dark plot targeting King Henry VIII. With great reluctance, Joanna assumes her role in a prophecy foretold by three different seers, each providing another vital piece of this strange, otherworldly puzzle. Ultimately, she is swept up into an international intrigue against her King and country. Joanna realizes the life of Henry VIII, as well as the future of Christendom are in her hands, hands that must someday hold the chalice that lays at the center of these deadly foretellings. 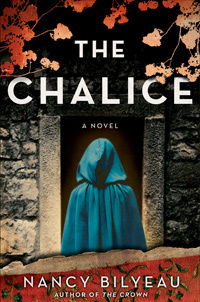 1) What role does prophecy play in The Chalice? How does this idea of prophecy drive much of the book? What are your beliefs regarding seers and prophecies? 2) Why do you think Bilyeau uses a young novice like Joanna Stafford to carry out such important historic weight as to save Henry VIII or destroy him? 3) “Why must this burden fall upon me?” Joanna asks Edmund when they are in Blackfriars, and he answers, “It’syou. You are a woman unlike any other, Sister Joanna. I’ve tried to define this quality that sets you apart. I’ve never quite been able to.” Can you define it? How does Joanna’s character shape and affect the unfolding of the story? In what ways does Joanna’s character change over the course of the novel? In the end, how have the events of the novel changed her forever? 4) Who directs Gertrude Courtenay to find Joanna? Were you surprised by this revelation? How are Joanna and Gertrude’s lives bound up, beyond the fact of their relatedness by marriage? How do their fates become so entwined? And how does it tie back to Katherine of Aragon? Discuss, as well, how Gertrude and Joanna’s lives are directly impacted by the Boleyn family. 5) Joanna resists meeting the seers and hearing the prophecies, and yet Bilyeau writes, “We’d all been forced to abandon our dream. Yet now, because of what I’d revealed, a restoration was possible. Why didn’t I surge forward, snatching at my place in the prophecy, eager to bring back our way of life? But I couldn’t.” Why do you think she isn’t able to? What are the myriad ways in which Joanna resists her fate and why? Discuss the idea of free will versus fate, and fate versus destiny. 6) Geoffrey Scovill appears in several places to warn Joanna or to help her or to persuade her to be with him. He claims he wants only her happiness, and yet when it is time for Joanna to marry Edmund, he prevents it. What was your reaction to his behavior at that moment? Sometimes Joanna wants Geoffrey near her, yet at other times she pushes him away. What is your impression of their relationship? When they meet again in the cemetery, Scovill regrets that he didn’t appreciate his wife, Beatrice, more before her death. What do you think Scovill has learned about love and life? What do you think the future holds for Geoffrey and Joanna’s relationship? 7) When Joanna is alone in Blackfriars with Edmund Sommerville, Bilyeau writes, “I waited, with eyes shut. After I don’t know how long, his lips pressed against mine, but so gently I almost doubted it was happening. I had never felt a touch this tender. I ached for more from him.” How does Bilyeau handle the delicate issue of desire in a work about celibate religious men and women? How does Joanna deal with her own desire? 8) Just as Gardiner once used Joanna’s father to get her to look for the Athelstan crown, now when Jacquard Rolin threatens Edmund’s life to force Joanna to complete the prophecy. When she complies, what does this say about Joanna’s character? Her sense of loyalty? How might you respond in a similar situation? 9) When Joanna meets Ambassador Chapuys in Antwerp, she says, “I know that you and others look to me to put a stop to evil. But in so doing, I am creating evil…The man who spied for Gardiner in Hertfordshire and now Master Adams? God would not have it so—I know in my heart it’s not right.” What do you think about what Joanna says? How do you think Chapuys feels after she’s said this? Have you ever been confronted with such a dilemma in your life? 10) “Was I indeed a fool not to see that this was the plan from the beginning—for me to kill the king of England?” Bilyeau writes. “I’d hoped, and perhaps it was grossly unrealistic, that in the end I would commit some act, such as the abortive attempt to rescue the body of Thomas Becket, that would turn the tide of history…But how wrong I was, how tragically wrong. This, then, was the prophecy that I’d been intertwined with since I was seventeen. To be a murderess.” Were you surprised by this revelation as well? Were you hoping for a different sort of prophecy as Joanna was? What might it have been? 11) When Bishop Gardiner takes Joanna to see Gertrude in the Tower of London and Joanna asks her if she regrets she entered into conspiracy, given how much she has lost—her husband, her son, her homes and fortune—Gertrude hisses, “Never.” How do you feel about this? Do you find it hard to believe? What sort of a person is Gertrude? How would you feel in her situation? 12) Joanna asks Bishop Gardiner if he has written the article that forbids religious people from marrying with her in mind, and he says, “Did you really think that religious policy for the entire kingdom was written just to strike out atyou? Revenge, perhaps, revenge on my part for your failure to secure the Athelstan crown or perhaps for your recent flouting of my will?” Joanna says nothing, and then he finishes by saying, “You have never been a consideration of that import. Not everyone is meant to play a significant part in the affairs of the world, Joanna.” Do you believe him? Does Joanna? What do you think is the truth? 13) In the beginning of The Chalice? , John is a madman, running around Dartford spouting scripture about doom. In the end, he turns up at Joanna’s house in Dartford sane, well-dressed, and working as a wood collector. Do you think he is a symbol and/or metaphor for something in the novel? If so, discuss what it might be. 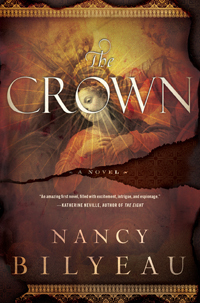 1) Read Nancy Bilyeau’s debut novel The Crown, which also features Joanna Stafford. 2) If you are in New York City and interested in tapestries, you can visit The Cloisters; they showcase two sets of breathtaking tapestries known as the Unicorn tapestries and the Nine Heroes tapestries. The Metropolitan Museum of Art in New York City is also a wonderful place to see medieval artifacts, paintings, tapestries, and clothing. 3) If it is more historical information about this period you are after, there are two wonderful books by Alison Weir:Henry VIII: The King and His Court and Six Wives of Henry VIII. 4) Enjoy these films about this period in history: Henry VIII: Mind of a Tyrant, is a wonderful 2009 TV documentary by historian David Starkey which follows Henry from his childhood to the end of his life. But if you’re in the mood for fiction films, try Anne of a Thousand Days and A Man for All Seasons and/or the Cate Blanchett Elizabeth films. When Joanna Stafford, an aristocratic young novice, learns that her rebel cousin Margaret Bulmer is condemned by King Henry VIII to be burned at the stake, she makes the decision to break the sacred rule of enclosure and run away from her Dominican Order to stand at her cousin’s side. Arrested for interfering with the king, both Joanna and her father are sent to the Tower of London. During their imprisonment, Joanna meets Stephen Gardiner, the powerful Bishop of Winchester, who allows her to leave the Tower on one condition: that she return to Dartford Priory to search in secret for the lost crown worn by Saxon King Athelstan. In order to save her father, Joanna must become a pawn in a struggle between religious extremes. As she faces challenges on every front, Joanna must determine whom she can trust and how far she is willing to go to protect a life that she loves. 1) What does Joanna Stafford’s decision to flee the Datford priory to attend Margaret’s execution reveal about her character? Why is she willing to compromise her position to bear witness to her relative’s last moments? Why do you think Nancy Bilyeau chose to begin her novel with Joanna’s journey to Smithfield? 2) “[Margaret Bulmer] sought to harm no one. She and the others wanted to preserve something, a way of life that has been honored for centuries. Which gives comfort to the poor and the sick. They rebelled because they felt so passionately about their cause.” Why do the Catholics in England face political persecution at the hands of Henry VIII and his government in the aftermath of his annulment of his marriage to Katherine of Aragon? Why does Joanna risk exposing her own religious beliefs in her spirited defense of Catholic rebels like her cousin Margaret Bulmer? 3) Were you surprised when Geoffrey Scovill came to Joanna’s aid in Smithfield? To what extent does his decision to protect her seem selfless? Do you agree with Geoffrey that Joanna’s decision to attend the execution as an unescorted gentlewoman was ill-advised? If you were in a situation in which a relative in the last moments of her life depended on you for spiritual sustenance, would you take the same risks? Why or why not? 4) “I said nothing. There was no amount of abuse, no device of torture, that would ever make me disclose what had happened on the single day that I spent in royal service ten years ago.” Why does Joanna choose to conceal this? How does that episode affect her ability to trust men? How does this moment of foreshadowing by the author affect your feelings when the facts of Joanna’s having been sexually abused by George Boleyn are revealed much later in the novel? 5) How would you describe Joanna’s experience in the Tower? Why does Lady Kingston’s servant, Bess, agree to help Joanna try to make contact with her father, Sir Richard Stafford, in the White Tower? What do you think of Joanna’s experiences in the Tower tunnels and chambers? What aspects of those scenes were especially evocative for you? 6) Why does Bishop Gardiner seek out Joanna in the Tower? Why does he use Joanna’s father to blackmail her into doing what he asks? What does her decision to go along with his requests and deceive the prioress at Dartford, among others, reveal about her sense of filial obligation? 7) How does Joanna’s intimacy with the disgraced and dying Katherine of Aragon make her vulnerable to Gardiner’s quest for King Athelstan’s missing crown? What complicated motives might be behind Gardiner’s quest for the crown? 8) On her deathbed why does Katherine of Aragon urge Joanna to “protect the secret of the [Athelstan] crown” for the sake of her daughter, Mary? Why does Katherine choose to reveal the possible existence of the Athelstan crown to Joanna? 9) How does Joanna Stafford get along with Brother Richard and Brother Edmund, when they all return to Dartford Priory on Gardiner’s orders? How does their friendship change when Joanna discovers that Edmund sends her letters to Bishop Gardiner and Richard oversees their exchanges and facilitates their work? Why does Gardiner choose not to tell the three of them that they are all working for him, searching for the Athelstan crown at Dartford? 10) How does Lord Chester’s murder affect the mood at the priory? How does Joanna’s and Edmund’s interpretations of the Dartford tapestries yield to uncovering both the murderer and motivation? 11) How does the revelation of the Athelstan crown’s existence—and that it contains thorns from the crown Jesus wore—make Joanna’s quest more urgent? When Bishop Gardiner discovers Joanna and Edmund disguised at the Howard home, why doesn’t he punish or attempt to detain them? What role does Mary, daughter of Katherine of Aragon, play? 12) Did you like the ending of The Crown? What do you think will become of Joanna? What could her return to Dartford suggest about her aspirations—spiritual, romantic, and otherwise? 1) In The Crown, Joanna Stafford exhibits a kind of family loyalty that many readers may relate to. She sacrifices her spiritual calling to show support for her condemned cousin, takes many risks to save her father, and accepts her much-younger stepbrother as her flesh and blood on her father’s deathbed. Who in your life has made sacrifices out of loyalty to you? How have you demonstrated your loyalty to others? 2) Are you interested in visiting or learning more about Dartford, England, where the Dartford Priory was located? Visit http://www.dartford.gov.uk/dartford/history.htm, to read up on the history of the village of Dartford. This Web site features a tremendously detailed historical time line and useful information about the priory and its role in the town’s medieval history. 3) “Divorced, beheaded, died, divorced, beheaded, survived.” Have you heard this famous mnemonic about the wives of Henry VIII? What possibilities were there for noblewomen in this era? How did members of your book club feel about the portrayal of women—whether it was Katherine of Aragon, Anne Boleyn, Joanna Stafford, Princess Mary, Lady Kingston, or Bess? What did it mean to be a woman at this time in England? Of the many women featured in the novel, which did your book club most admire, and why?